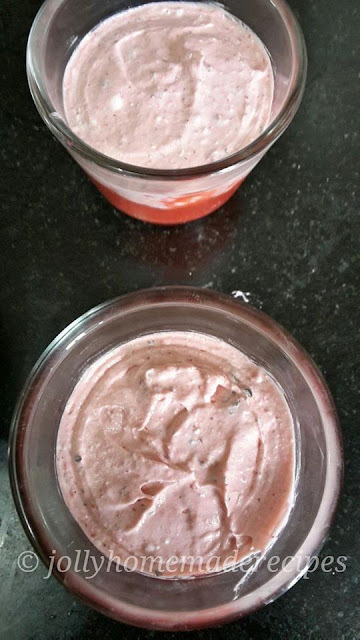 Eggless strawberry mousse recipe with step by step images - It's a very easy and quick dessert recipe. 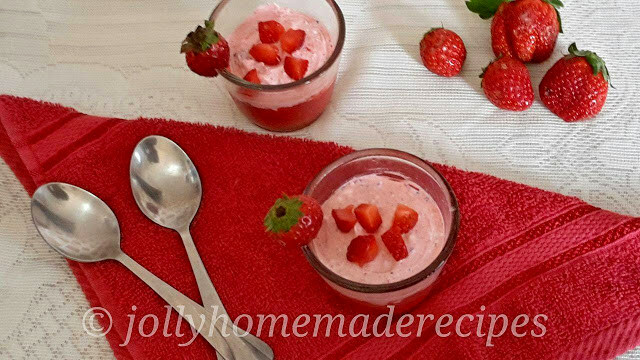 Serve this eggless strawberry mousse as a dessert after meals or you can have it anytime. It's so good & yummy. This is eggless mousse recipe and I am sure you and your family will loved it. 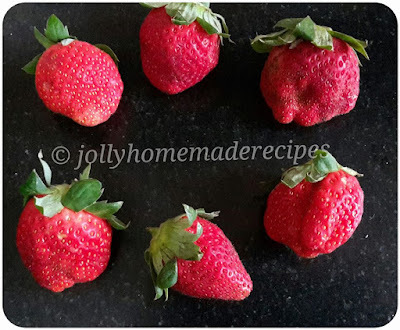 Strawberries are in season and I loved strawberries and used in quite number of recipes. I made this recipe using balloon whisk, because I don't have electric beater, balloon whisk will take lot of time to convert fresh cream into whipping cream. If you have electric beater use it or otherwise you can made in a grinder too. Presenting 16th successful FoodieMonday Bloghop theme party..and the theme is "Eggless Mousse". 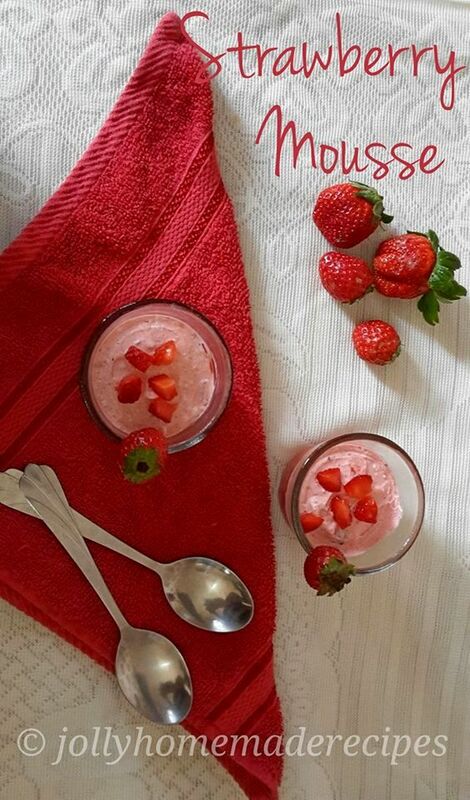 So I am presenting my favourite mousse i.e **Eggless Strawberry Mousse Recipe**. 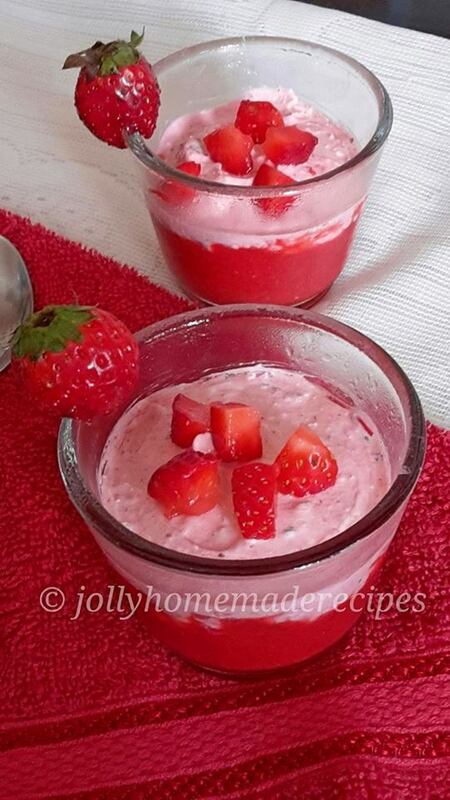 Serve this eggless strawberry mousse as a dessert after meals or you can have it anytime. It's so good & yummy. This is a very easy no cook versions, I referred few recipes in google and got an idea, then made it. 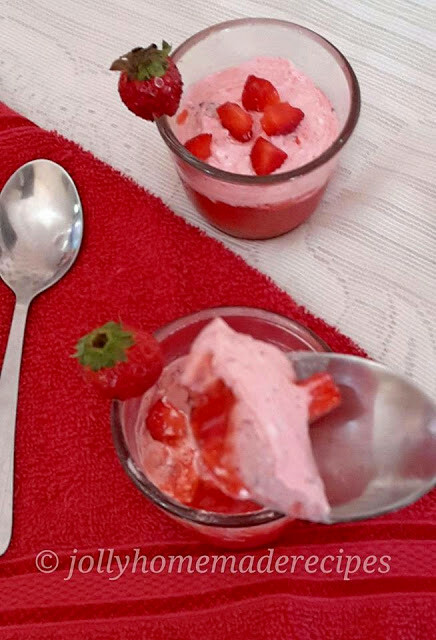 Sweet tangy mousse made with only 3 ingredients. 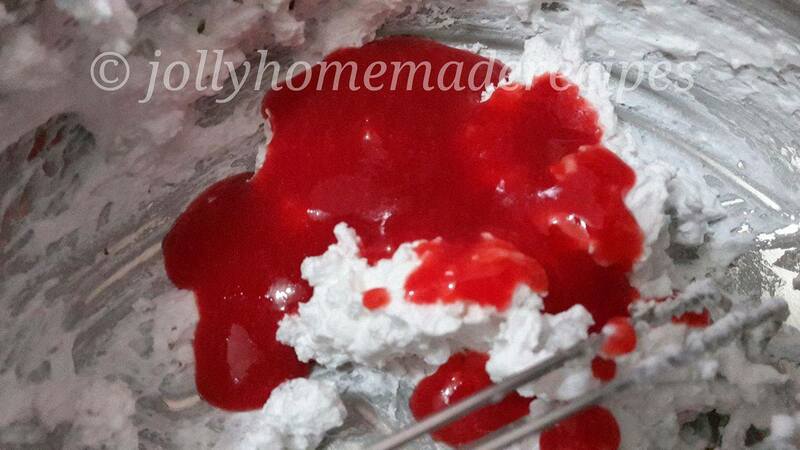 There are two main ingredients which are strawberry and whipped cream. 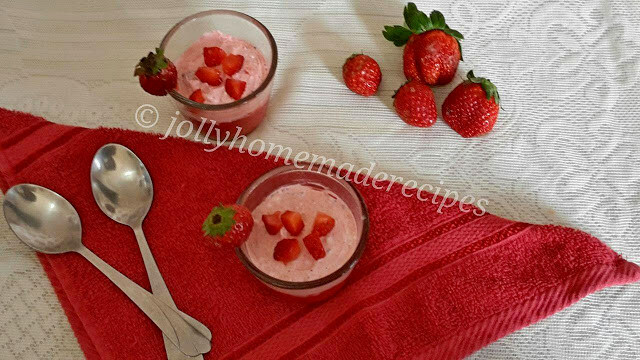 I love strawberries in desserts...This creamy dessert is very easy to make and liked by all generation. Let's start making of quick strawberry mousse recipe with step by step photos. 1. First chill the cream for at least 2 hours as the cream has to be very cold for whipping. Start whisk the cold cream transforms to fluffy peaks faster, so make sure to thoroughly chill the cream and any instruments involved including the bowl container it'll be whipped in and the tool(like mixer-grinder, hand-blander, fork, or balloon whisk which I used) you'll use to incorporate air. 2. 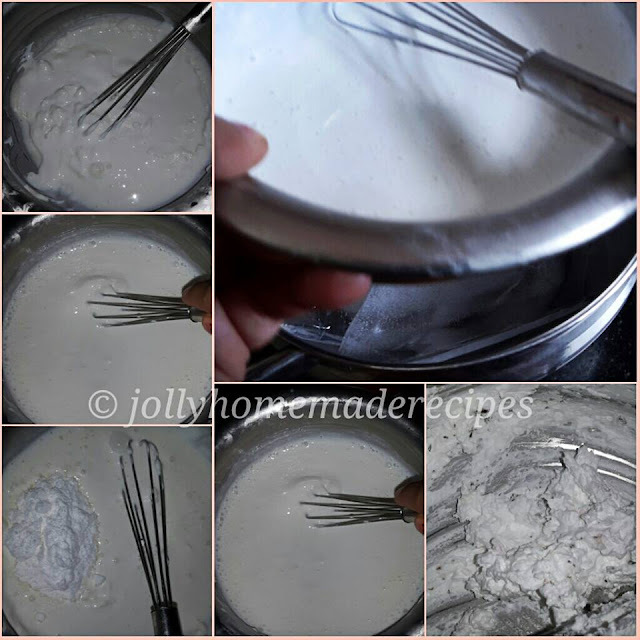 Put it into a bowl and start to whip till soft peaks form as shown giving ice bath in down the whipping cream bowl. Wait to add flavorings until the cream has been whipped to the desired thickness. 3. Sweeten it to taste with a tbsp of powdered sugar (or leave it unsweetened). Add a 1/4 tsp of vanilla essence into the cream for flavor. Whisk it little bit..This is the right stage, don't whip it more, then it will end up in butter. 4. Rinse strawberries well, trim off the leaf part. Add them to a blender or grinder along with sugar. I added about 2 tbsp of sugar, but the amount of sugar to be added depends upon the sweetness of the strawberries. 5. 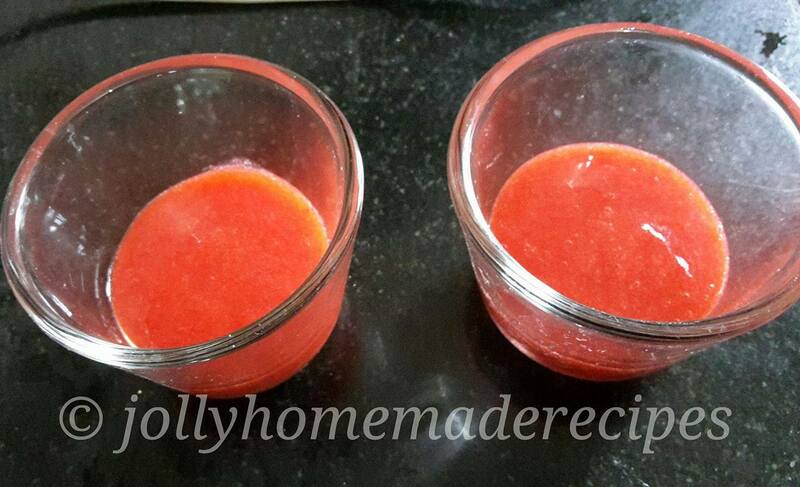 Blend to a smooth puree without any strawberry chunks. 6. Pour a large tbsp of the puree in shot glasses or bowls. I added the puree in 2 glasses. 7. 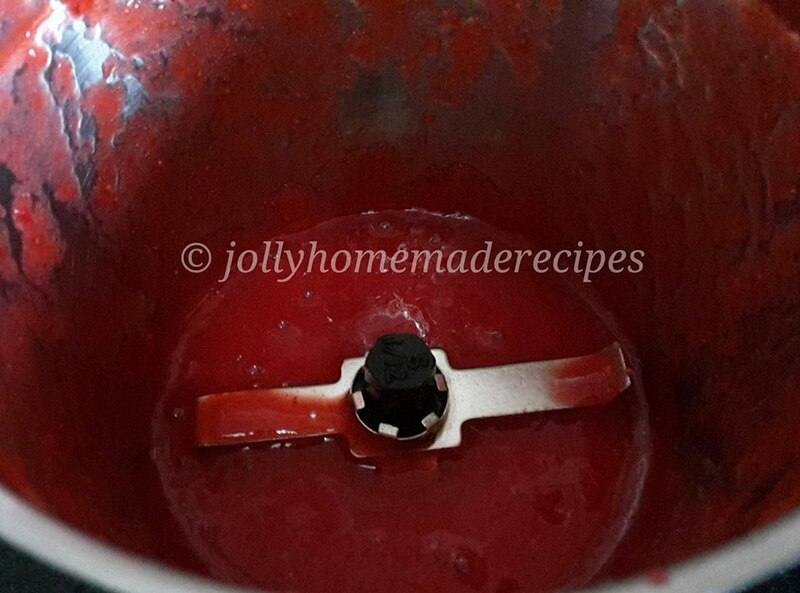 Then add the strawberry puree into the mousse and fold it with soft hands. 8. Pour mousse onto the top of puree and refrigerate it at least for an hour to set. 8. 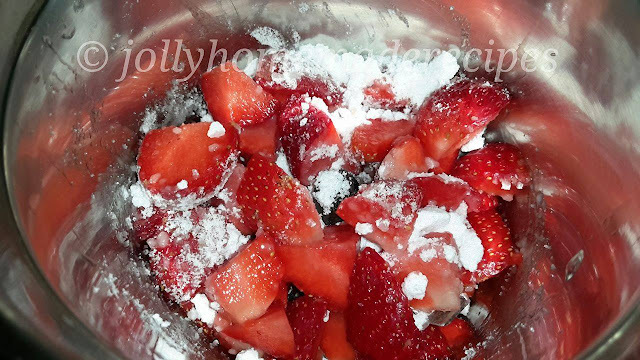 Serve chilled and garnish with chopped strawberries. * I just set it for 30mins and then clicked the pictures, if you set it for an hour or more the texture would be slightly thick. * Let it to set atleast for an hour and then dig in. Lovely colour and Texture dear. Love the 2 tone color of your strawberry mousse. Great recipe. I've made a similar mousse, but I love your layers - that looks so elegant!